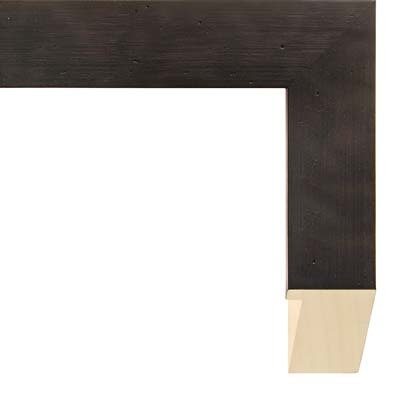 Stretched canvases are certainly a possibility with this dark metallic wood picture frame, but thinner materials are also a potential match, such as beveled mirrors in an industrial or machine age design setting, or graphite and charcoal drawings in a modernist room. Additional possibilities include floating art with the use of either shadowbox walls or mat combinations with built up layers of foamcore for depth between mats. This dark metallic wood picture frame could also be used in a series to tie a room together around a specific subject matter. Imagery that would fit the look of this dark metallic wood picture frame includes fish & wildlife nature scenes such as river and fish species illustrations, along with medieval images and renderings that correspond to a dark olive color scheme. For that matter, prints and posters featuring the works of John Waterhouse, such as Lady of Shalott, might be suitable matches for this frame. Acid free mats to consider with this dark metallic wood picture frame include Wise Green 9527, Olive Branch 9532, Sierra Olive 9822, Underbrush 9603, Rhino 9629, Mocha Green 9826, Hedge Hog 9530, and York 9861.